Supernumerary teeth are commonly encountered in our day to day life by the general dentist. Most supernumerary teeth are located in the maxilla with male predilection. Detection of supernumerary teeth is best achieved by thorough clinical and radiographic examination. Their management should form part of a comprehensive treatment plan. This article presents a clinical and radiographic study of hundred cases of supernumerary teeth and an overview of the clinical problems associated with supernumerary teeth. Oral cancer is one of the most mutilating diseases afflicting mankind. Precancerous lesions, conditions, and early stage oral cancers cannot be adequately identified by visual inspection alone and may be easily overlooked and neglected. Differentiation between early stage cancers, precancerous lesions and benign lesions is often difficult because of the similar appearance of these lesions. Moreover progressing premalignant lesions may be genetically different from their morphologically similar non-progressing counterparts. Early diagnosis is one of the most important single factors in combating oral cancer. Definitive diagnosis of malignant and benign lesions is commonly based on histological examination but a noninvasive and simple screening test may be desirable as an adjunctive method. Thus a method of detecting oral cancers and precancerous lesions at early curable stages is crucial and may lead to a reduction in the currently unacceptably high oral cancer morbidity and mortality rate. This article tries to briefly overview the various diagnostic aids and recent advances in early cancer detection. Nucleolar organizing regions (NORs) are loops of DNA containing ribosomal RNA genes. In human, they are located on the short arm of the five acrocentric of certain chromosomes. An increase in number of AgNORs counts have been documented in some malignancies compared to their benign counter parts. The aim of the study was to correlate and compare AgNOR count in speckled leukoplakia, oral lichen planus, oral submucous fibrosis and in oral squamous cell carcinoma and to assess if AgNOR count could contribute to the pre-therapeutic assessment of the biologic aggressiveness of the disease and to detect malignant potential of premalignant lesion and conditions which could render us to assess the prognosis of the disease. "Necessity is the mother of all inventions". This is also true in case of cancer therapy. Though malignant diseases are being treated by various therapeutic modalities, the greatest drawbacks are recurrence and distant metastases. Few of the treatment methods are also associated with serious side effects, disfigurement and disability. To overcome these setbacks, new treatment methods have been proposed, few of them seem to be very promising. This scientific paper is an overview of the recent advances in cancer therapy. Angina bullosa hemorrhagica ( ABH) is a rare lesion encountered in routine dental practice. This lesion usually presents as a localized hemorrhagic blister with unusual dimensions which makes the diagnosis difficult. This report is aimed to create awareness in the dental fraternity about the occurrence of the lesion given its rarity and the risk of misdiagnosis with other vesiculo bullous entities. Hemangiomas of the jaw bones are rare benign lesions characterized by proliferation of the blood vessels. Peripheral hemangiomas that involve the soft tissue are more common in the mandible than in the maxilla. A case of peripheral vascular hemangioma in a young female patient which shows diversity in the site of occurrence is reported along with the latest investigation procedure that was employed for the diagnosis and treatment planning of maxillo-facial hemangiomas. Lingual thyroid is a rare congenital anomaly that results from the failure of descent of the primitive thyroid from the foramen caecum. A case of ectopic lingual thyroid in a 28 year old female is reported here, along with review of literature with respect to investigations performed, various management modalities of lingual thyroid and the outcome of these approaches. We have also discussed the differential diagnosis of lingual thyroid. Massive osteolysis is well known by the synonyms vanishing bone disease, phantom bone disease. First case ever reported was by Jackson in 1838 and later in 1972 in a patient with disappearing humerus. Romer in 1924 reported first case in the jaws. There are only very few cases reported in the jaws in the literature. 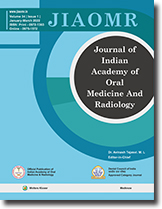 Considering the rarity of the condition, this case of massive osteolysis of entire mandibular involvement, in an Indian woman is the first ever case to be reported in the literature. Thus we report here an interesting case of vanishing bone disease of the lower jaw and a generalized wasting in a 60 year old female patient.The clinical and radiologic findings were consistent with the criteria for the diagnosis of Gorham's massive osteolysis. Odontomas are the most common non-cystic odontogenic lesions representing 70% of all odontogenic tumors. Often small and asymptomatic, they are detected on routine radiographs. Occasionally they become large and produce expansion of bone with consequent facial asymmetry. We report a case of such a lesion causing expansion of the mandible in an otherwise asymptomatic patient.